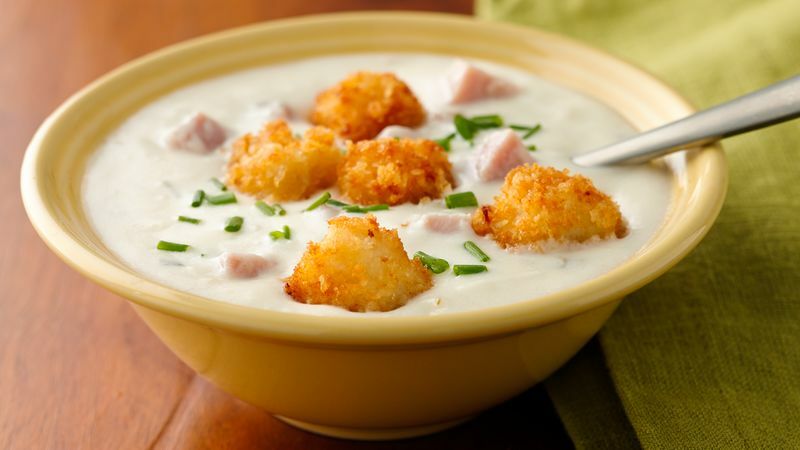 Place 1 tablespoon of the milk and 1/4 teaspoon salt in large bowl. Add chicken pieces; toss to coat. Add bread crumbs; press to coat. Set aside. In 4-quart saucepan, heat 1/4 cup of the oil over medium heat. 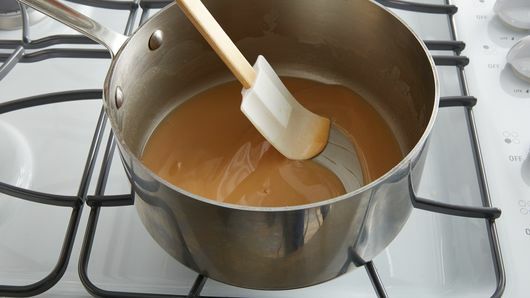 Add flour and 1/2 teaspoon salt and cook, stirring, 2 to 3 minutes, until thick and starting to turn golden brown, being careful to stir around side of pan. 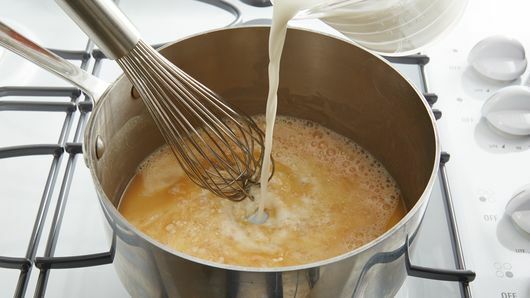 Slowly stream in remaining milk, beating constantly with whisk, until incorporated. Stir in ham with spatula; increase heat to medium-high and heat just to simmering, then reduce heat to low and simmer 5 minutes. Remove from heat; add cream cheese, and stir until melted. 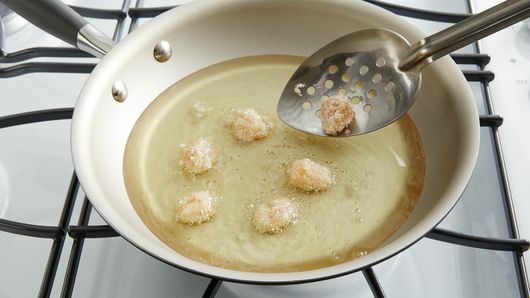 In 10-inch skillet, heat remaining 1 cup oil to shimmering over medium-high heat. 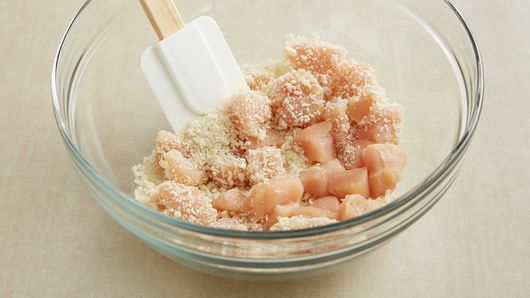 Press bread crumbs to chicken once more, then gently place chicken pieces in hot oil. Discard any leftover bread crumbs. Cook chicken 3 to 5 minutes, turning occasionally, until browned all over. Using slotted spoon, transfer to paper towel-lined plate to drain. Divide soup among 4 bowls. Top with chicken croutons. Garnish with chopped fresh chives, if desired. 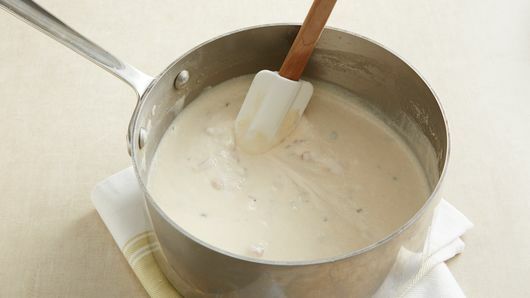 Using whole milk in this recipe prevents the soup from separating. Regular cream cheese can be used instead of the chive and onion variety. Just add a little green onion or chive to the soup to keep that onion flavor.